Since it's March I would love to say that the balmy, winter weather is over, but I know better than that. Unfortunately March can be a cruel month, leading you to believe that the worst is over and Spring has sprung, but that's not always the case. March is definitely one of those months that you have to pay close attention to the weather because one day it can be close to 70, and the next, low 40s. It's always a good idea to have a few quick recipes ready to go for those days that the weather is just a little more balmy than expected - such as a quick, filling soup. I first saw this soup a few months ago in a Cooking Light my boss discarded in the magazine pile at work and I knew I needed to make it. The problem is - I lost the magazine for a few months and couldn't remember where I saw the recipe. Upon finding it while cleaning I knew I immediately needed to make this recipe. I love anything potatoes and I was gearing up for a chilly weekend, and Saturday afternoon alone, so I figured what better time to try it out then a quick weekend lunch. I have never been so glad to actually make something for a weekend lunch! Not only was it delicious then, it made for great leftovers for work since it's always a little chilly in the office! And, bonus - not too bad for you! I'm not saying this was an uber-healthy meal, however as starchy soups go this was a light version that wasn't light on flavor by any means! Pierce potatoes with a fork. Microwave on HIGH 13 minutes or until tender. Cut in half; cool slightly. While potatoes cook, heat oil in a large saucepan over medium-high heat. Add onion; sauté 3 minutes. Add broth. Combine flour and 1/2 cup milk in measuring cup; add to pan then add the remaining 1 1/2 cups milk. Bring to a boil; stir often, being careful to not let the milk boil over. Cook 1 minute. Remove from heat; stir in sour cream, salt, and pepper. Arrange bacon on a paper towel on a microwave-safe plate. Cover with a paper towel; microwave on HIGH for 4 minutes. Crumble bacon. Scoop potato into soup and discard potato skins. Coarsely mash potatoes into soup using a potato masher. 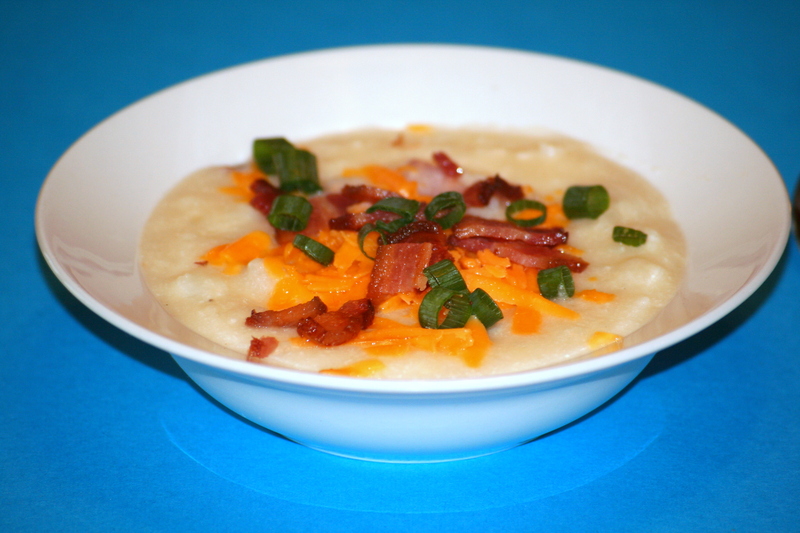 Ladle soup into bowls and top with cheese, green onions, and bacon.